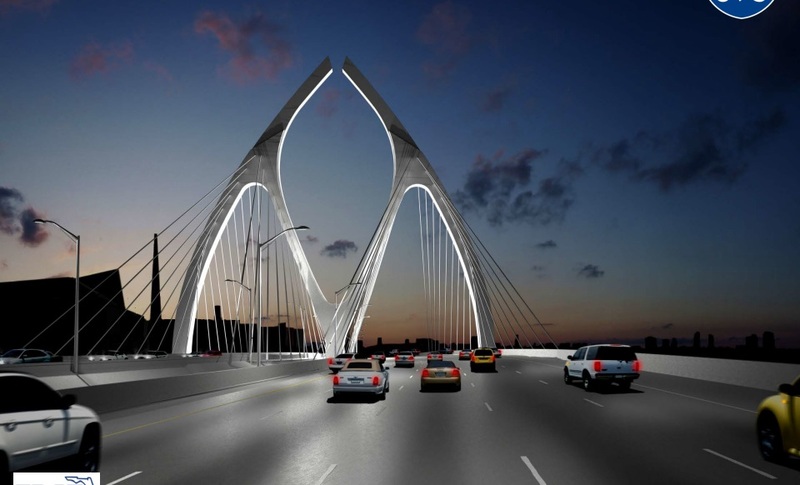 Florida Department of Transportation officials have narrowed it down to two final options for the $600 million signature bridge that will be built through downtown Miami, according to Miami Today. The Wishbone design and the Lotus design are the two finalists. Officials rejected the Regatta and Emergence designs, which weren’t as impressive. A preliminary design will be finalized by January 2015. 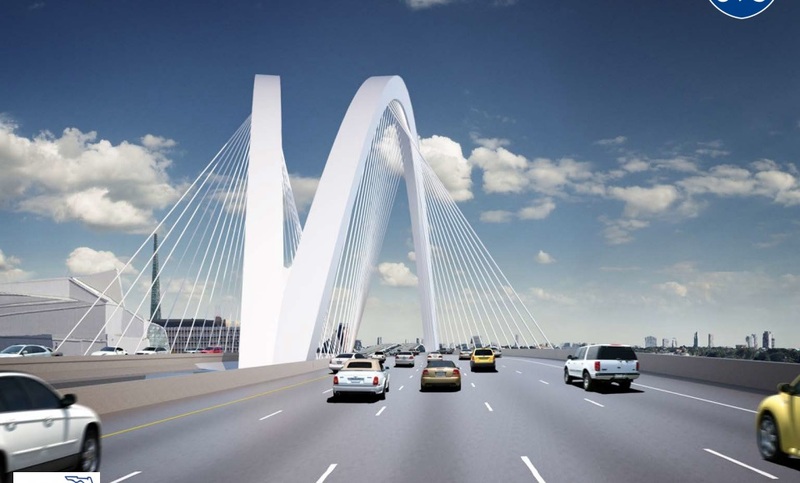 The bridge is fully funded and will begin construction in 2018. FDOT has already begun the process of obtaining control of adjacent property by eminent domain. You guys always amaze me. Really nice exclusive. To me the wishbone bridge is clearly the better choice. Go ExM. Coming through with the best renderings on any news source! (imho)…. And I agree with Leon.. Both are nice. At first I was impressed by the renderings; now I don’t see the point of this from these pictures that are posted. I can’t believe that the state of Florida is willing to spend $600 million or more on a freaking mediocre land bridge when we are in dire need of transit. I just don’t understand this state at all. With that kind of money we could have definitely had a rail line to South Beach from downtown Miami. 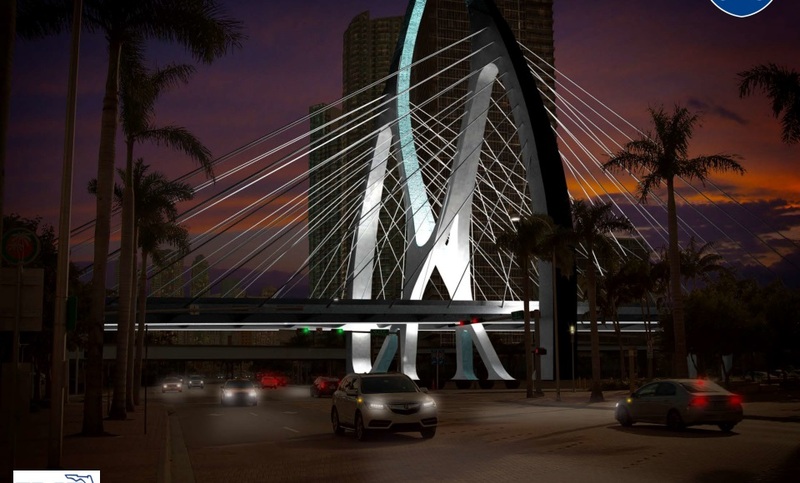 The same Governor (Rick Scott) who gave back $2.4 Billion (for high speed rail for the state) to the federal government because he claimed that we would owe them; now he is willing to build a useless simple bridge that will not even be praised as an iconic Miami/Florida structure. Ridiculousness….. It will look pretty iconic, IMO. How so? 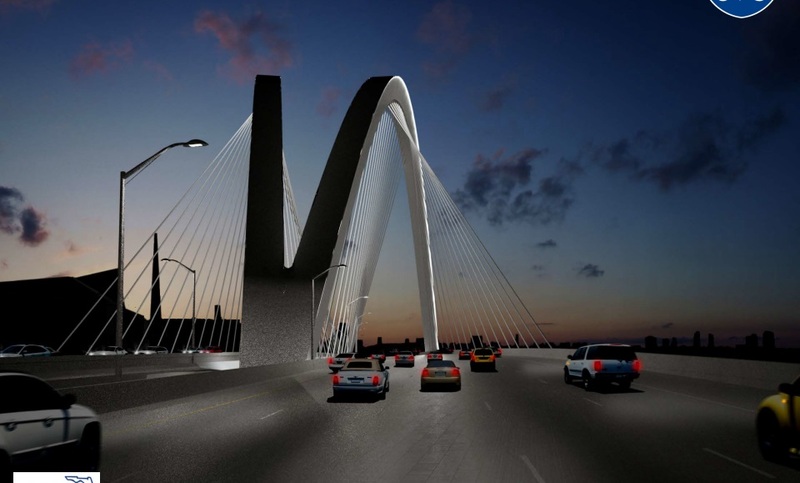 It is not even that much taller than the performing arts center, is only concrete, looks cheap, and no color..
who cares about iconic bridges, that does nothing for us. money and time should be put into important things like public transportation and urbanization. Forget the fancy stuff on top. 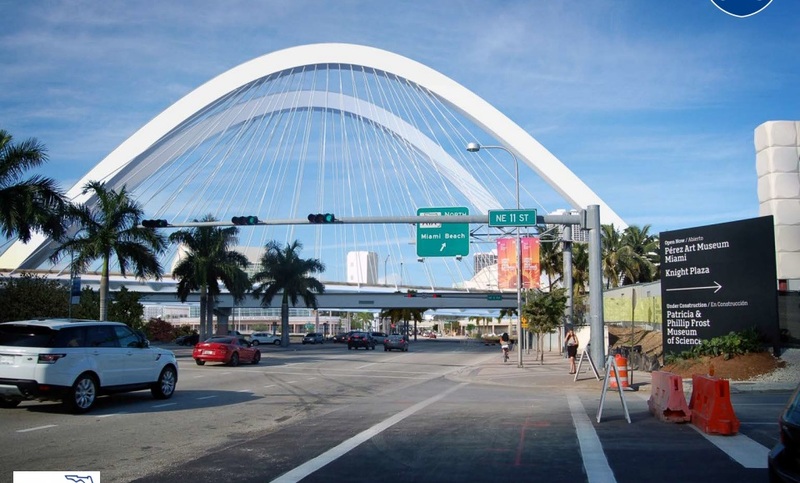 The point of the redesign is to upgrade I-395. The point is not on the topside but the underneath really. It will be more wide open and lit at night making it safer and more welcoming for foot and bicycle traffic once all the redevelopment of the area is complete. This will be a 600 million dollar boondoggle just like Marlins Stadium. The only way this area is going to be redeveloped is if the city decides it’s had enough of its homeless and low income neighbors literally blocks away from this area and stretching far off to the north, west, and a little south…they’d have to redevelop about 80% of the downtown area…this is horseshit…we need a real functioning public transit system liken the one that was demolished by GM in exchange for the Julia Tuttle Causeway funding they provided. 100% of that area will be redeveloped eventually. They were going to have to do something about that bridge anyway. It’s 50 years old and is no longer safe. At the very least, FDOT was going to spend several hundred million to rehab it. Obviously you don’t know about SunRail in Orlando or Tampa’s Rail plans which were in the works before that high speed rail project. Sun Rail is up and running. Have to agree, it’s a waste of money. I thought this bridge would be flying much higher and would be much bigger. I’d rather go for a tunnel, unless there is a redesign. 700 million for such a mediocrity? In China they’ll build you ten of these for the price. This bridge would be more impressive over water like a replacement to macarthur or julia tuttle. They actually plan on filling some of the area under the bridge with water. Wishbone!!! The Lotus looks like weird futuristic font. I get that is in the shape of an “M”, but that is a bit cheesy. Hope they build this soon and expeditiously. I like the wishbone, but still think it looks odd that it’s on land. It would really make a statement over water, as Laz says. Also agree with Iloveplanning that it is a waste. The money could be better spent on mass transit, bike lanes, etc etc etc. Yes @Ed….the tall buildings overshadow the bridge. So there really is no point for the design. They should just do a regular overpass bridge. 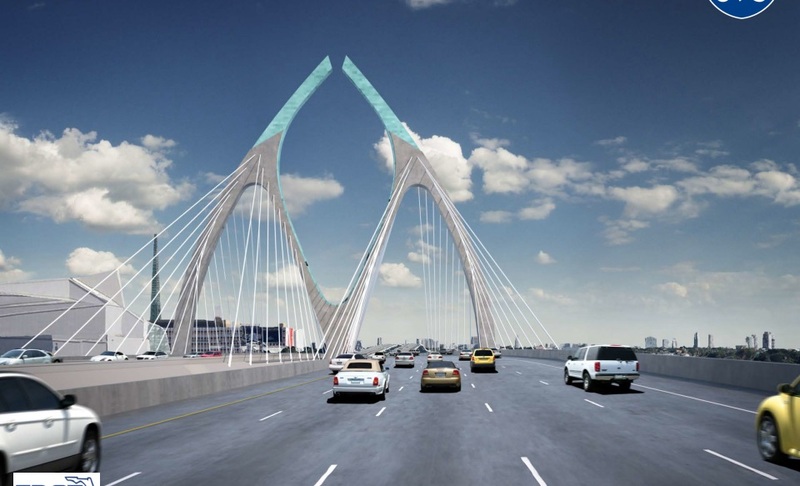 If they really want to make a statement; it would need to be a very large suspension bridge. 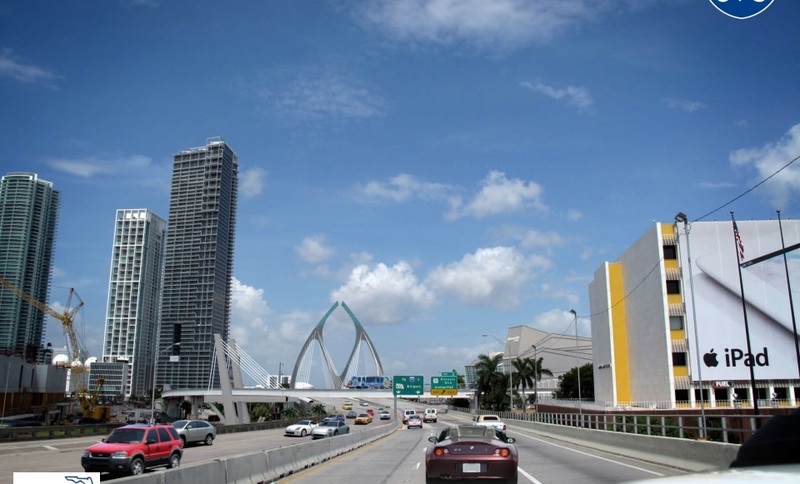 By making it taller and wider, it would then make a statement that Miami is all about connectivity. I don’t see that with what I’m seeing. What i find interesting is that everyone keeps saying we nees more transit.. yet no uses the existing transit. People still drive all the time! The transit is fine. I have used it many times. Get people to ease up on cars and the city might see a need to use more funding. The people saying we need more mass transit are users of mass transit. FYI, South Florida has one of the greatest increases in use of mass transit for something like the last 5 years and every year is higher than the last. Some people, like the thousands in Edgewater and Midtown, lack access to the limited areas Miami’s mass transit serves. iloveplanning is right, that money would be better spent on an elevated transportation system. 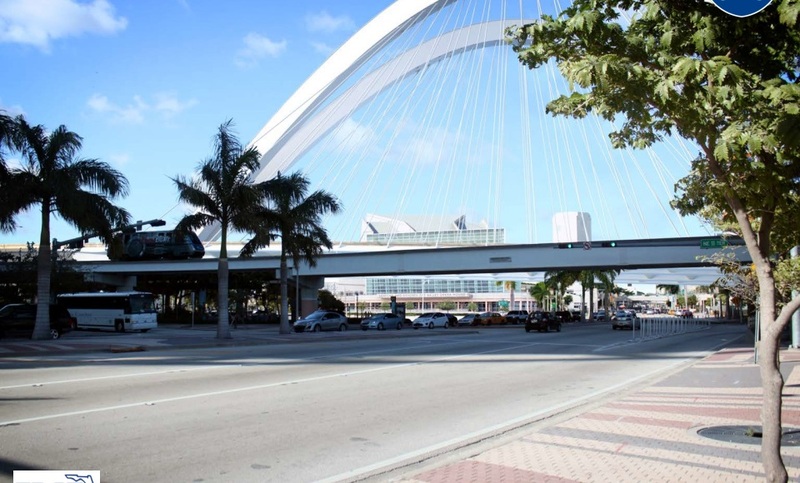 What you guys don’t seem to get that the I-395 overpass was getting millions spent on it regardless by FDOT since it is a 50+ year old overpass and they deem it needing rehab. I use mass transit every day, don’t drive to work, and want an expansion of the little we have but you’re wasting your breath if you thought this money that has been earmarked for I-395 for a couple decades can just be used on something else. 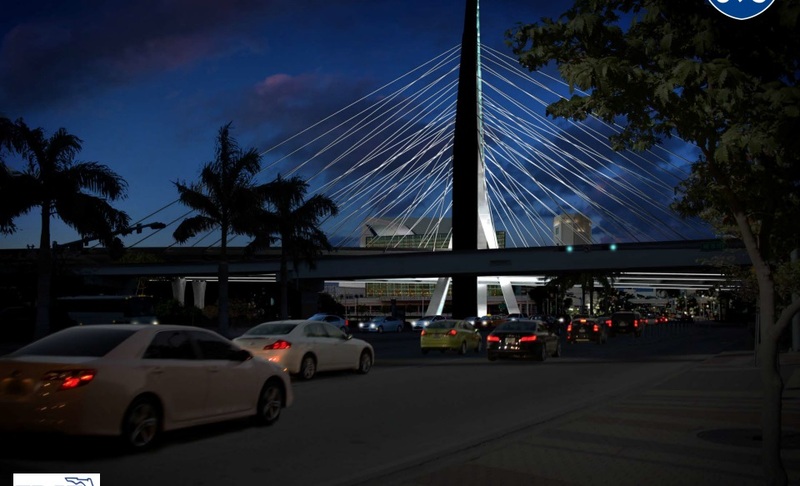 All this “bridge” does is call more attention to the real problem which is I-395 bisecting Biscayne Boulevard, it doesn’t resolve it. I am a little confused by these photos, I thought the whole reason for this bridge was to elevate it really high. At least that is what I remember reading a few years ago about this project. So either the photos are not drawn to scale or they have abandoned the idea of raising the bridge all together, which would be a real shame. Hopefully more details will come out soon. Yeah, i dont think they’re raising anything. 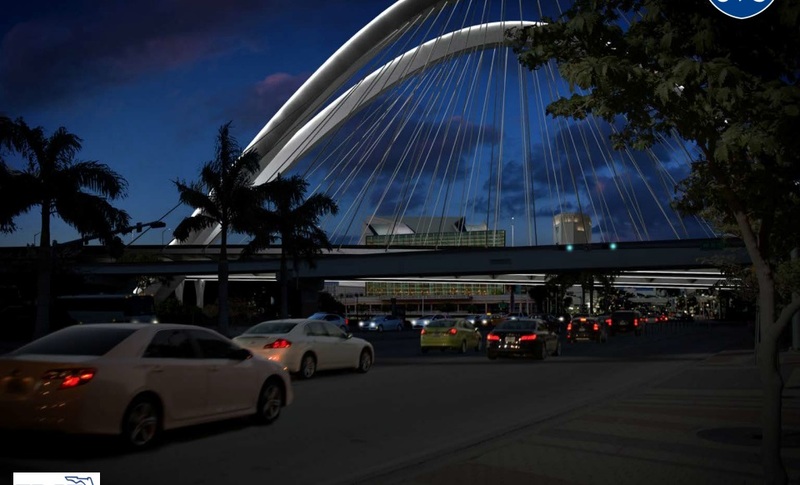 Think they’re fixing the on off ramp situation, making the entire I395 elevated via the bridge portion around Arsht/Biscayne Blvd and pedestals the rest of the way while having it lit underneath. Spending more and burying I395 freeing up more space/land seems like a better idea to me. In my opinion, the wishbone looks better up close but the Lotus looks better from afar. It’s the aerial view that matters most so my vote is for the Lotus design. The people on here yaking about not using the money for a better mass transit system in Miami don’t understand this point, this bridge will be built by and under the control of the Florida Department of Transportation. The FDOT has nothing to do with funding or coming up with funds for the city of Miami’s metrorail system. If Miami wants a Baylink style line to MB, it’ll be up to the city and county to come up with the funds to build it. Is there any way to start a petition to demand that they at least study the underground model. For cost and source if funds???? Who knows this? 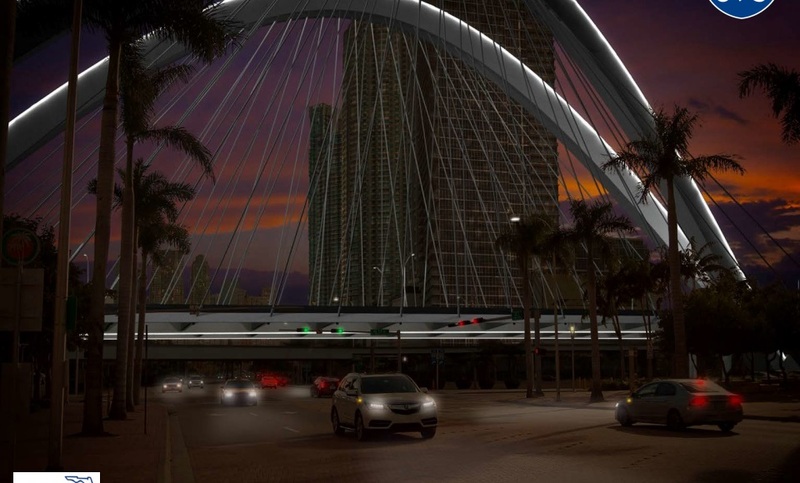 In both renderings I see a new bridge for the metro mover. Is that part of the same plan? Although I don’t like the color on the top, I vote for Lotus. Wishbone is nice as well but it looks to me too…Calatrava. Waste of money. Really simple absolute waste of money. 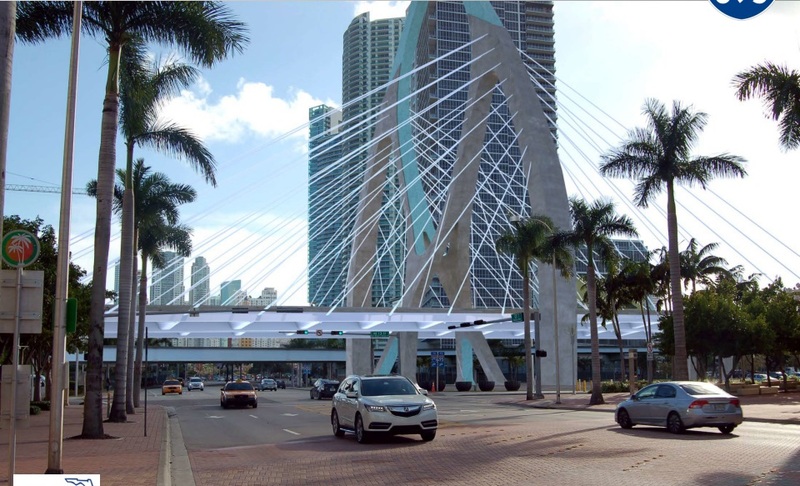 This low suspension bridge will not remove the visual divide between downtown and edgewater, and will just be a prettier version of what already exists. Bury I-395 and really make a difference…it’s been done in Philly, Boston, Dusseldorf…yeah it’s probably more expensive, but it will be long lasting and actually make a difference. Plus costs will be partially recouped by the developable land generated (which also adds more tax money). Ohh yeah, and even a pretty bridge will still smell like urine and human feces underneath. stop spending the money in Non sense we need more public transportation ! what about more metro rails all over the city !! The state does what it wants with its money. Unfortunately it’s not county or city money. I agree with burying it. Look at what the big dig in Boston did — now the whole North End is connected with a great park looking at the backdrop behind Fanuel Hall. Dallas also has its highway partially buried with Klyde Warren park on top, connecting their downtown and arts district with uptown. For all the people so concerned about connecting Mimo and edgewater condos, how about burying it to return Overtown to a vibrant and prominent African American community? It used to be like New Orleans and Harlem before the state used eminent domain to break it into quadrants and build out the highways, turning it into a slum instantly. It’s the biggest hypocrisy for people talking about creating a cultural area for the melting pot of Miami. Looks cool, but they better fix I95 first. They’re planning on a 2018 start for I-395. They’re currently working their way down I-95 and are still just north of the Golden Glades interchange. Supposedly the really bad portion south of Golden Glades is slated for repairs the first quarter of 2015. It needs to be elevated to connect the city regardless of how the top looks. A signature structure needs to be part of the design but if the street is ignored they are undermining all the work being done to invite us all to enjoy downtown. A few years ago I was invited to a city planning meeting with a lot of other Realtors and I remember vividly they said the causeway could not be buried because of flooding concerns with a tunnel. But since then they went and built the Port Tunnel with no problems, so I don’t think there was a lot of truth in that statement. I am also in favor of burring it and giving Overtown the openness that it once had. Hope someone with some influence is reading these posts. According to that video posted above, it’s $1 billion for a tunnel and cost was the big element that they want to see elsewhere. There is a great documentary somewhere on what the highways did to Overtown. Making overtown a decent neighborhood again will bridge a gap between the hospitals, omni, and downtown. Ideally, we would be burying I-395 to better unite these areas and add more open space. Can’t help but feeling that increasing the size of this structure only exacerbates this division. Understanding that it doesn’t matter and one of these will be built regardless, I prefer the wishbone. 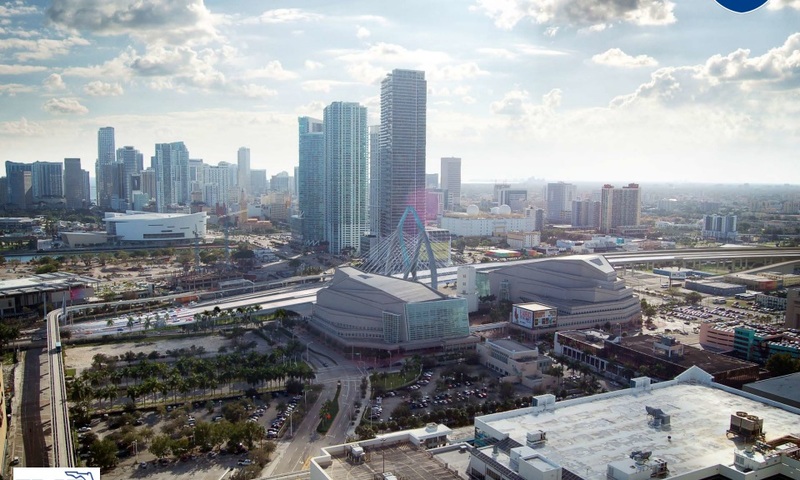 All the improvements to Downtown Miami are welcome as our city is poised to become the next NYC in the next couple decades. It is already the second most important financial district in the east coast and infrastructure is part of a growing city. 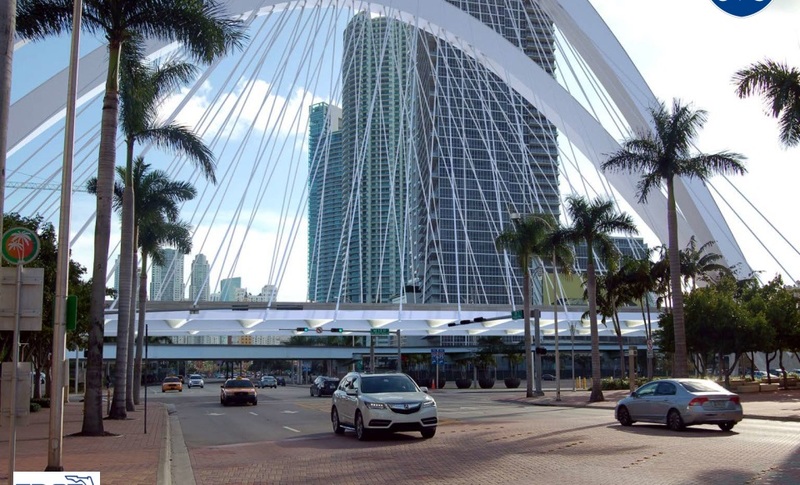 However, I would rather see a bridge into and out of Brickell Ave. which is where the real problem lies. If something isn’t done about that soon, the new 1000+ condos and their residents coming to the area with Brickell City Centre and other buildings will create pandemonium. It already takes hours to get in an out of Brickell during peak hours. Officials really need to look at that more than the current bridge being proposed. Bravo Mario,best comment posted so far.That “bridge” connecting Brickell with the rest of Miami downtown is garbage in the middle of billions worth condos and office buildings.Every time crossing it,makes me scream. The only thing that would work is to shut that bridge down all together and I am not sure if that is even possible. Other than that, would be to only allow boats to go through late at night. Once again I am not sure how feasible that would be. I just read the whole article. It looks like they opted out of the tunnel option because it would be too expensive, but at least it sounds like the new bridge will be elevated. I really don’t think anyone cares about Overtown, they just want to keep using eminent domain and acquiring more land they can develop. The new Grand Central Station and Miami World Center will eat up a lot of Overtown, and my guess is that is where Beckham will eventually build his Stadium too. That’s a good guess from what the messaging has been.